Morocco has always been a place on my bucket list to visit. An intro to the Arab world, with a mixture of glamour inspired by the ancient cities of color. I’ve traveled to over 30 countries and Morocco truly stole my heart. Not only was it the most challenging in the oddest ways ( language barrier, Arabic men are just gorgeous and mysterious and the hustle of the souks and cabs) beyond the madness their is so much beauty behind every door. I met so many kind people more than I ever have on a journey that just radiated love. From dancing in Marrakesh the night away, 4×4 to the desert in luxury with @desertluxurycamp ( plus our amazing driver ) traveling to Fez and the famous Blue City “Chefchaouen” There’s so much to see in Morocco but adding our favorite list of things to do is worth a try. You’ll spot gypsies, snake-charmers, henna artists, magicians, and #BeautyExplore the markets of Jemaa el-Fnaa, one of the Best Souks in Morocco for an unforgettable experience. Overwhelming? Yes! But so worth it. Seeing so many colors, energy, and vibrancy just walking through the alley ways. There is nothing that isn’t sold here- perfumes, spices, bags, shampoo, body soaps, shawls, carpets, face creams, Argan oil and much more. Wondering what’s a must to purchase ? 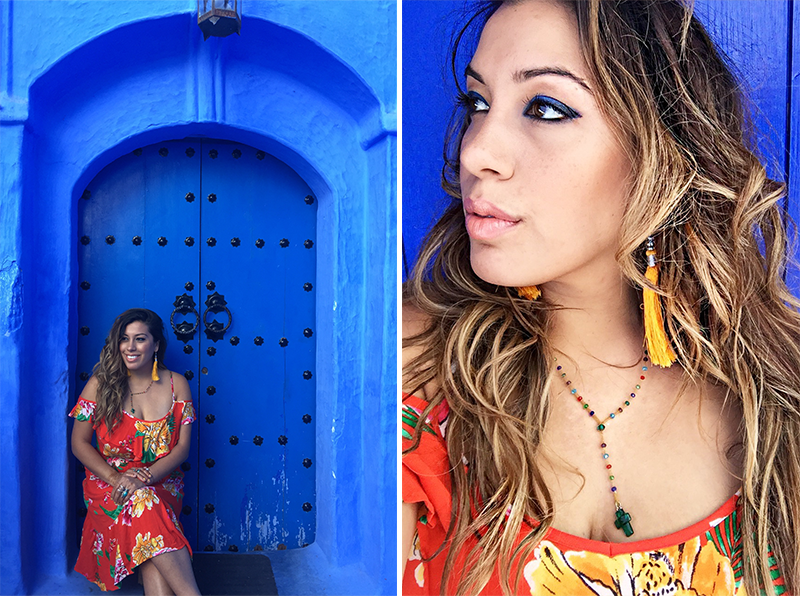 On this beauty journey we visited Marrakesh, Fez, Checchaouen and spent time exploring the Sahara Desert. Here is our list of beauty stops that we recommend for you next trip to Morocco. For us visiting the Medina Market was where we spent most of our time and finding a restaurant that stayed authentic while offering a variety of food and entertainment was key. We fell in love with this place not only for the great food that was Moroccan but also the international cuisine surrounded by live music, belly dancers, and all the Moroccan flair. Not to mention the owner being raised in France has great taste when it comes to wine selection and the chef being trained in Abu Dhabi brought out some of the best gastronomy work I’ve ever had the pleasure of tasting. Named “World’s Best Moroccan Restaurant 2017” we found this awesome restaurant and had the pleasure of speaking to the owner over a chicken burrito in the medina in Fes. Nur offers fine dining in the Medina of Fes featuring the flavors of the Middle Atlas through a creative lens. Important to make a reservation and plan ahead of time. They’ll set up a pick up and drop off from your hotel. What I loved about this place was how their elevating the eating experience in Fes. If your looking for a special dinner with a great atmosphere consider making a reservation. Want something low key try their Mexican pop-up called Nacho Mama burrito house just around the corner. 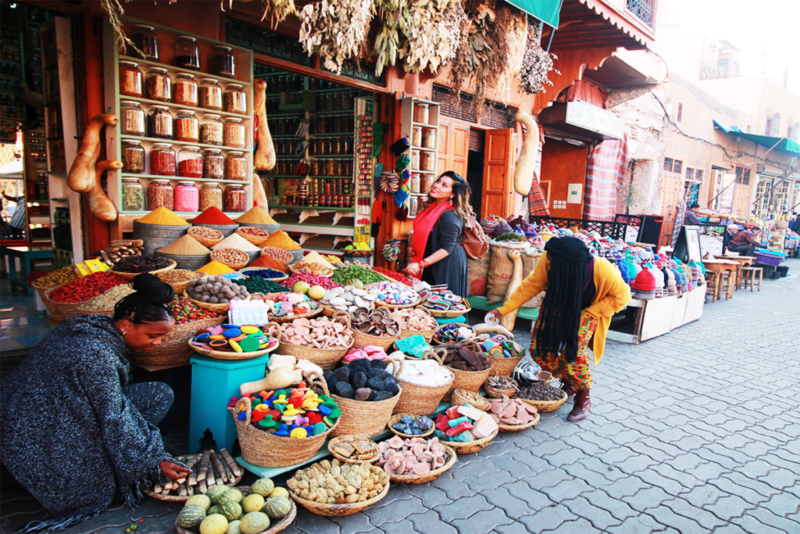 Visiting the Souks are a top on everyone’s list but you’ll need time to explore and get lost. When it comes to shopping and beauty. We suggest visiting the markets of Jemaa el-Fnaa in Morocco. I did travel to Fez, and other souks but I really think Jemaa el- Fnaa had the most options when it came to clothing and cool finds. We found a cool more modern store called Max and Jane but to me always looking for something super authentic is key so just outside you’ll find a beautiful carpet store worth taking a look. To the left you’ll see a little shop that sells key chains and handbags for gifts. When it comes to shopping its all a game. At first, it’s overwhelming but once you get into the flow its a really fun game to play with the locals. They know what they’re doing and will ask you to name a price and you’ll go from there. The prices aren’t super cheap but the finds are one of a kind. You’ll find beautiful pots, bags, shoes, leather and our favorite light fixtures, lamps, and golden bathtubs. Basically split the number they give you by half. If they say 900 MAD say 400 MAD. If its to low they’ll let you know but I always like to see where the base price is. Things I regret not getting. I’ll find it cheaper or I’ll just get it in another city. Sounds familiar? Pillowcases: You’ll notice really cool pillowcases with portraits of indigenous women from Berber tribes. I regret not purchasing any of these while I was there. I thought I would’ve found them cheaper but instead, I left empty handed. I also fell in love with the yellow and blue pillowcases with poms and tassels. Tea set with glass cups: This is a staple in Moroccan life. Your day starts and ends with tea. You’ll see beautiful tea pots of all sizes being sold in the souks. Worth investing in a copper or silver set. A great place to share in beauty for a cause. The Henna Cafe is in Marrakech and provides a community cafe; a henna salon which offers an educational henna experience to visitors. 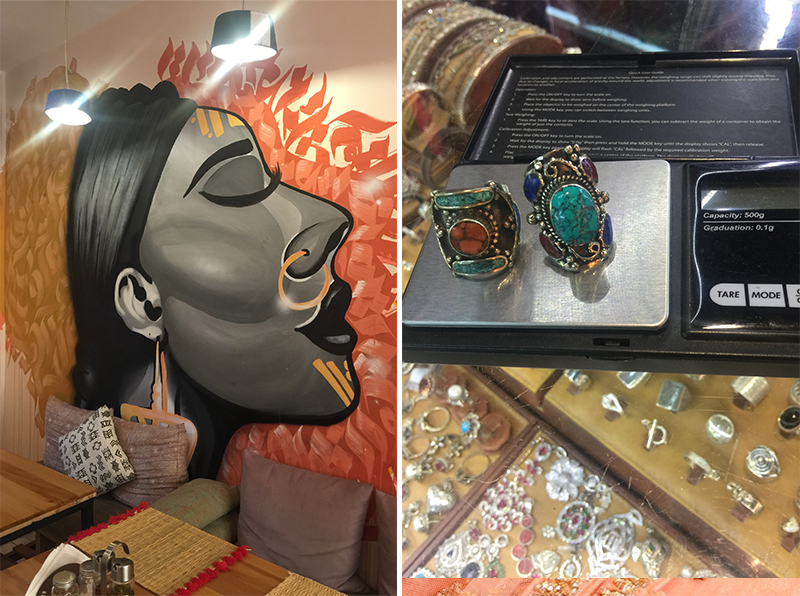 All of the profits from the cafe and the henna experience are used to provide assistance in Marrakech in the form of free education and support local projects. They offer henna classes and dishes at affordable prices plus a great selection of Moroccan teas. I loved that we were taken to this place by our local friend who spoke great English and said that’s where he learned to speak. 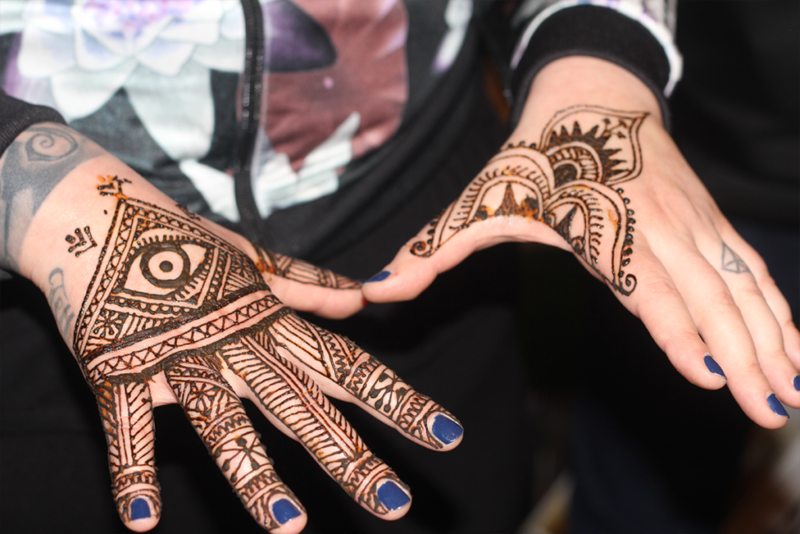 Trying to find good henna is a bit challenging as you’ll see many artists in the markets. Coming to the henna cafe is a lot more stress-free and 100% of the profits support the local community. It felt really authentic while getting an awesome organic hand design. 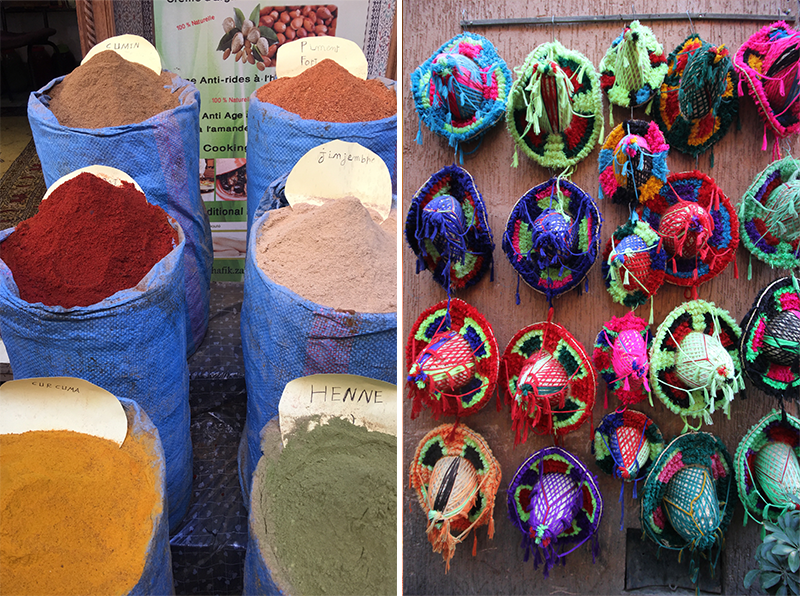 Spice Shops – There are so many herbs and spice shops in the Souk. Each one will direct you to a long introductory lesson by the owners trying to sell you their goods. 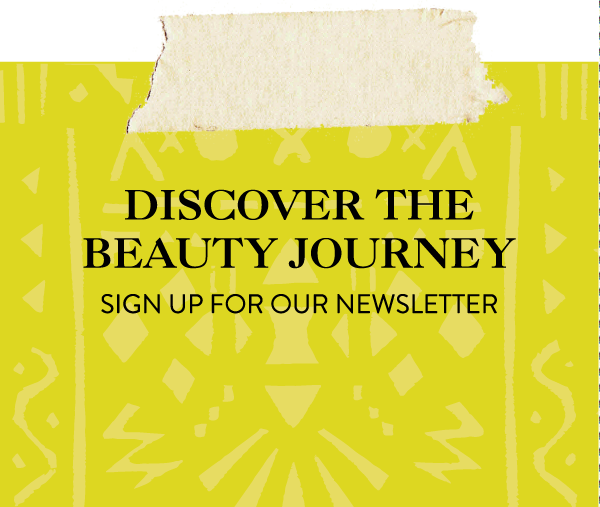 They’ll go deep into the meaning of their argan oil, black soap, husband concoctions, and plenty of herbal oils, and teas for all things beauty. I did discover a place where I really connected with the owner. Didn’t feel sold too but I, unfortunately, lost their card. I will update this post when I find it. It’s nice really getting someone to explain all the ingredients benefits and how Moroccans use them in their everyday life. For 180 MAD ( $20 usd) you can enjoy a day at the famous Jardin Majorelle. With your ticket, you’ll be able to enter the Berber Museum and the YSL exhibition that is just breathtaking. Walking around this garden is a great way to experience the beauty of color. Rich in blues, and yellow this garden shows the elegant decor in Moroccan lifestyle and also the backdrop to Yves Saint Laurent home and inspiration. Even if your, not a fashion lover its hard not to fall in love with the masterpiece of YSL and the art of the Berber. Hotel Riad Cherifa: If your thinking of doing a day trip to the blue city from Fes ( only 4-5 bus ride for less than $12 usd) I highly suggest staying in Hotel Riad Cherifa. Discovering this place was the highlight of my trip. The decor is beautiful and cozy. The food is delicious and the staff is exceptional catering for all your needs. From an indoor pool to a beautiful terrace there is no other place worth staying in then this riad. If I could do it again I would stay for 2 nights and 3 full days. One day just relaxing at the hotel, and then the other two exploring the blue city for your picture perfect moment. Desert Luxury Camp: Tucked in the magnificent dunes in Morocco this 9 hours drive from Marrakesh into the desert is what we all dream about when thinking of an adventure. 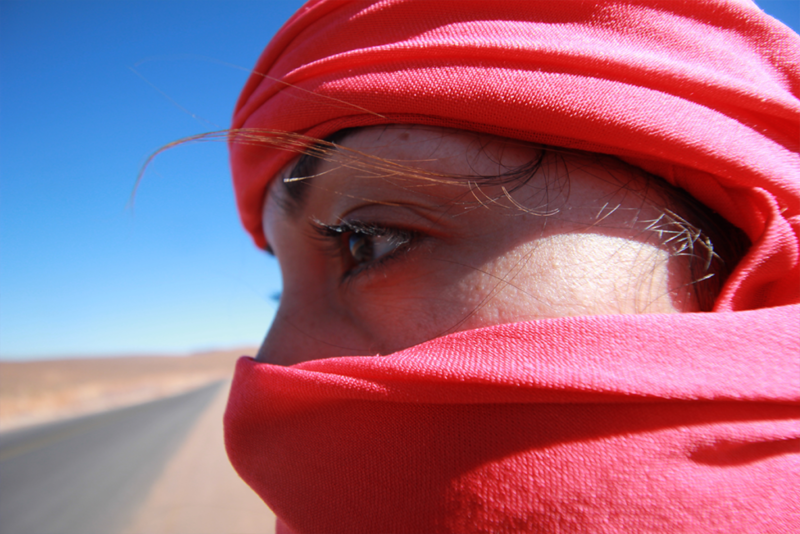 We booked a two night- 3 days stay in Merzouga with Desert Luxury Camp and hired a private driver from Marrakesh then to Fez. This experience was very relaxing and being in the desert came at a high price ( more than I would usually spend on a long journey) but it was well worth it. Our tent came with a heated blanket and a simple yet fun decor to make us feel like we were glamping in the middle of the sand dunes. In the morning we awoke to a gorgeous sunrise and enjoyed activities like camel-riding, sand surfing, and enjoying the stillness of the desert.